Age: 2 and a half years old. 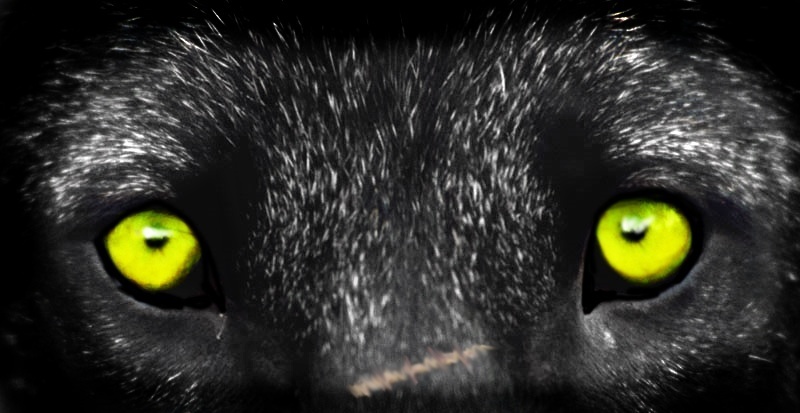 Eye Colour: His eyes are a sparkling lime green. 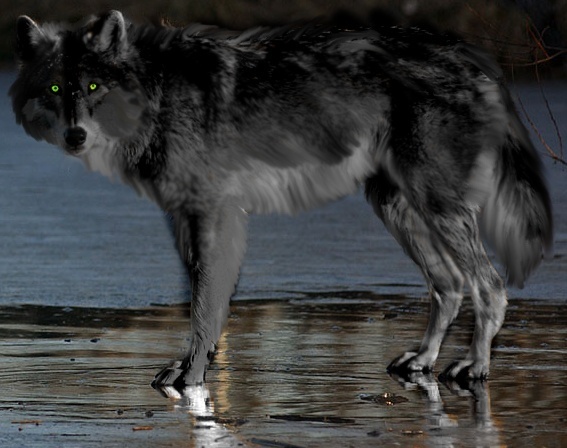 Outer Appearance: Yagami is a stocky dark grey male wolf. His underbelly and legs are a silvery grey. His muzzle tip is a the same grey and his fore legs have dark marks on them. Body Structure: Yagami has a lanky build, but he is still plenty strong. He's quite tall due to his long legs. His body has fine muscle on it. His eyesight is very keen, as well as his hearing and smell. 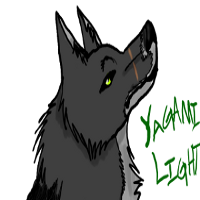 Personality: Yagami Light is often distrustful towards wolves he barely knows, often calling them stranger and empathizing it when he addresses them. He dislikes fighting with tooth and claw unless it cannot be avoided. Sometimes he seems all bark and no bite. But under that bark, there is a sharp bite. Sometimes, he's really cocky. As he had "adopted" his friend Yakima into his family, he seems to believe "Although blood is thicker, water is quicker." It means; "Your blood family may desert you or leave you behind in this world, but there are always more people out there who love you just as strongly, and it's easier to create a family of friends and water than that of rivals and blood." White or silver wolves, it's the main colour of the Blizzard clan. Pups, he doesn't like them or dislike them, he just is too lazy to care about them. Pack: This place. 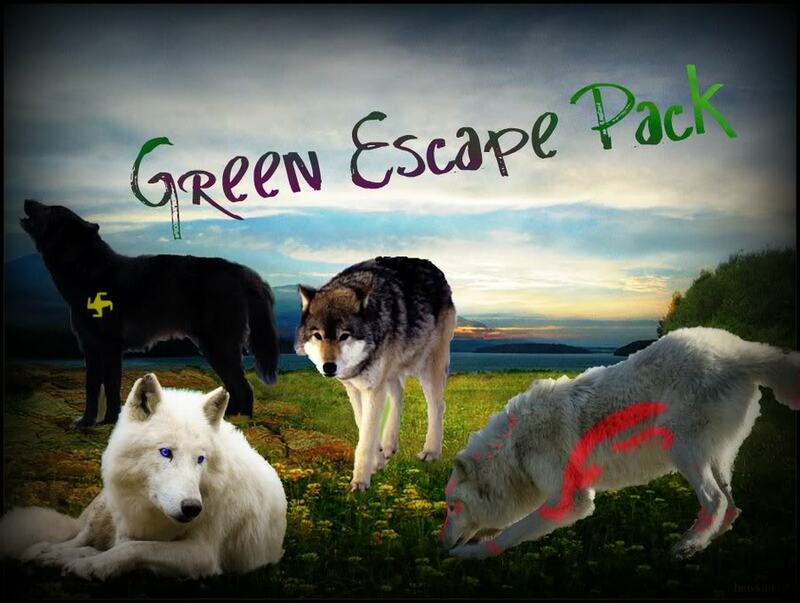 Green Escape Pack. Family in the Pack: Yagami has no ties. History: Yagami was born in a pack of 10 wolves, he was the second of his litter and grew to be a pack prodigy. Eventually, he was told to find the pack's previous prodigy, Yakima. Yakima was rather calm, though, he had a bloodthirsty side. Yagami was told to leave by his brother. "Leave, Yagami, you gotta go." Yagami refused. He was then knocked out and taken to a cave. He was abandoned. Father and Nee allowed it! Yagami met Yakima for the first time here, he was greeted with being cut by a mid-air blade. Yakima had security for no reason. "Did I.. disturb you?" Yagami asked. "Yes, you disturbed my nap. I'm Yakima, a prodigy from the Inferno Clan." "I'm Yagami Light, another prodigy form the same pack." "Aye, my successor, I'm destined to teach you." With that, Yagami trained and lived with Yakima for 5 months. The last day of the last month was awful. Yakima was murdered. His throat has a large tear in it and blood was pouring out. "Yakima!!" Yagami cried out. He still remembers this. He returned to his clan and grew up in sadness, missing his old friend. He eventually grew out of the deep despair of the loss and eventually was crowned Alpha by force. By that time, he seemed like an emotionless shell, unable to grow attached to anyone. He feared that if he were to grow attached to someone, he would lose them. Eventually a war broke out. The wolves of the Blizzard clan wee all either white or silver. Yagami led his pack to their defeat but was given a scar on his muzzle from the lead fighter of theirs, whom has ice white fur. It was marked with blood as an indication of how "tough he was". He left the pack when he was 2 and a half and roamed since. Habits: He tends to grind his jaw when around someone he dislikes or distrusts. He does this to get a bit of a feeling he's tearing apart their flesh. He has more habits. One of them happens wen he's excited, he'll end some sentences with "cha!". He has one habit that tends to cause him trouble, he'll say rude things, talk big, and be a smart bum. Even if he says he'll kill something, he most likely won't unless he places "I swear" into the sentence. Strengths: Yagami has a lanky build, but he is still plenty strong. He's quite tall due to his long legs. His body has fine muscle on it. This made him fast, but strong. Weaknesses: He's rather careless, to the point he won't notice if someone died. Nice bio Pureblood and your history is long.